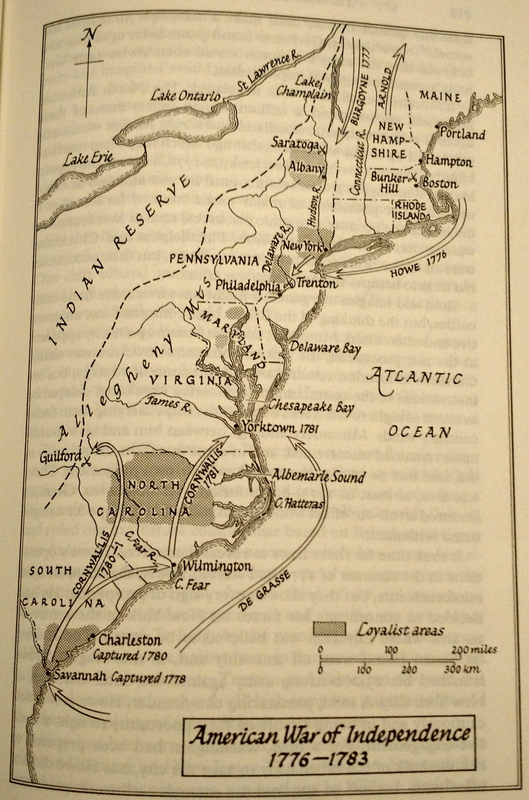 General Israel Putnam commanded the division from which the American contingent that was to occupy the peninsula was drawn. 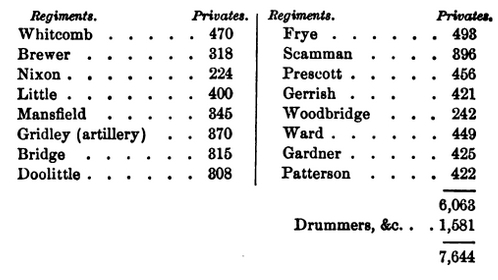 Detachments from Massachusetts and Connecticut were selected, led by Colonel William Prescott and supported by Colonels Frye and Bridge. [lxiii] Captain Thomas Knowlton was attached with 200 Connecticut rangers. Support was provided by Colonel Richard Gridley, chief engineer, “with a company of artillery”- 49 men. [lxiv] The total force was at least 1,200 strong, carrying 24 hours of rations, and accompanied by all the entrenching tools in Cambridge. 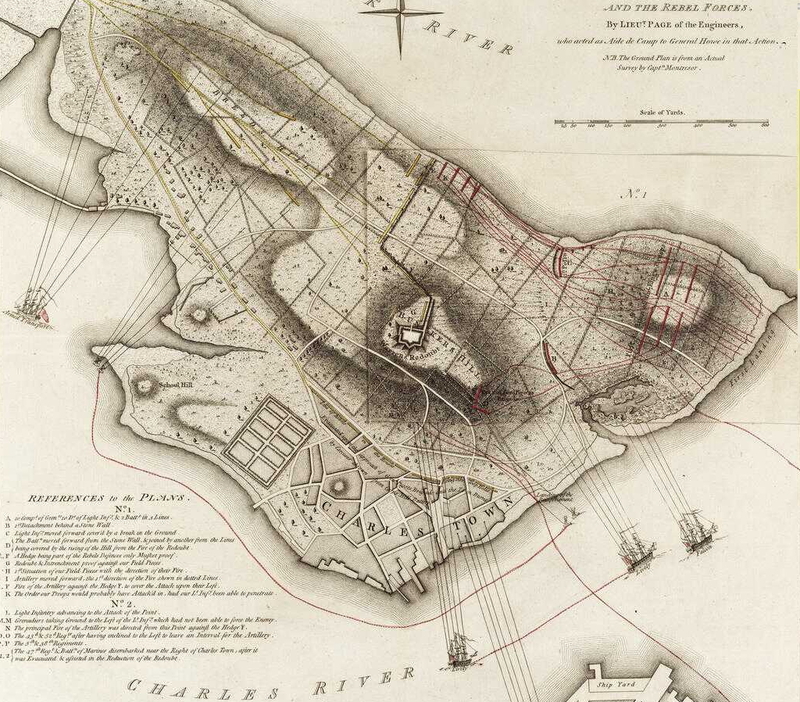 [lxv] Prescott’s orders were to fortify the Charleston peninsula, starting at Bunker Hill. He could expect support and fresh rations the following morning. [lxvi] As this contingent deployed it was joined by Major Brooks with more infantry and another company of artillery. 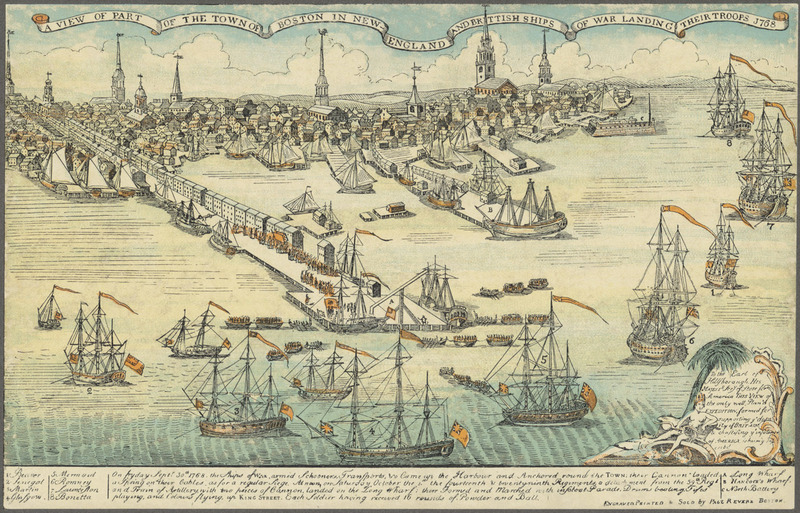 Captain Nutting was dispatched with a small detachment of Connecticut men to investigate Charlestown, and Captain Maxwell of Prescott’s regiment was sent to patrol the shore and observe the Royal Navy warships in the Harbour. 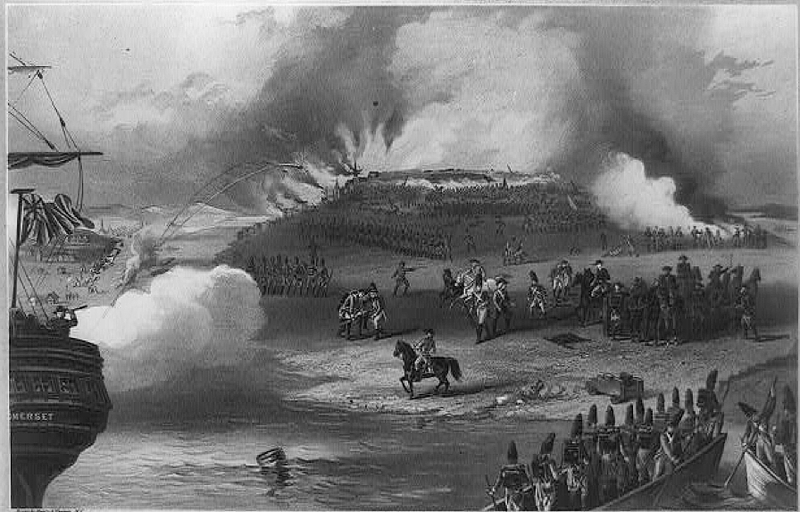 The base of Breed’s Hill was swept with naval fire as the regulars embarked. Gage dispatched ten companies of Grenadiers, ten companies of light-infantry, along with the 5th, 38th, 43rd, and 52nd regiments. [lxxxii] The British disembarked their force of 2,200 men at Charlestown point and took up position on Moulton’s Hill. 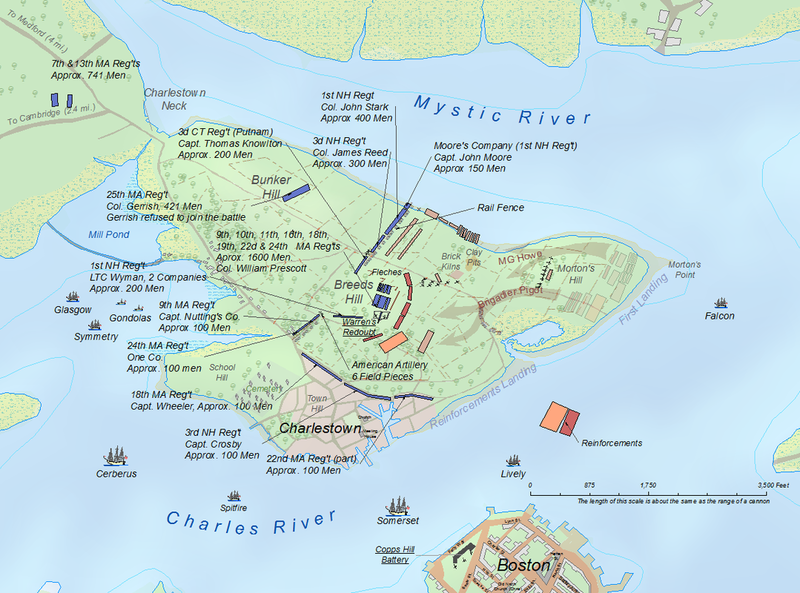 By about 1 pm, Colonel Prescott could see that the British were deploying towards Mystic River and Charlestown with the intention of flanking the Continental positions by going around the redoubt. 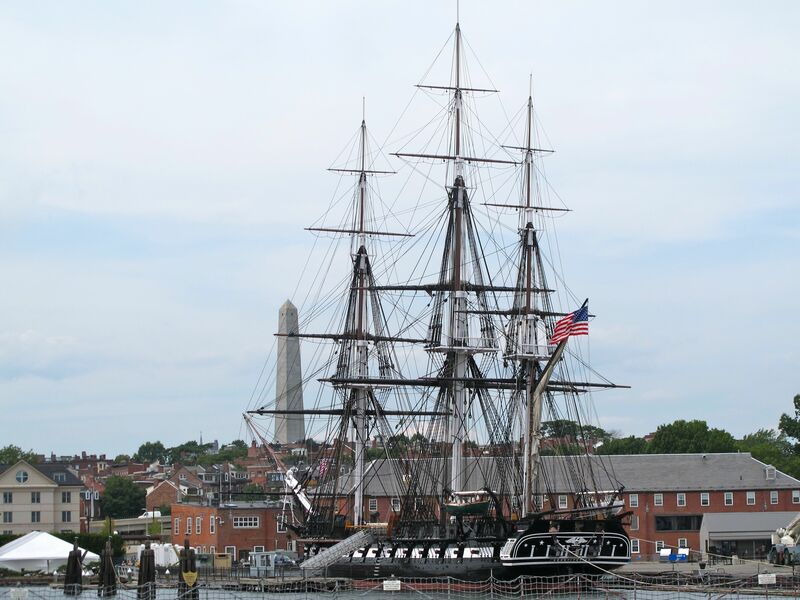 He thus dispatched Captain Knowlton with 400 men and two cannon to form works nearer the base of the Bunker Hill, thus cutting off the flanking efforts. [lxxxiv] Knowlton was soon supported by the New Hampshire detachments of Colonels Stark and Reed, together forming a line 900 feet long. 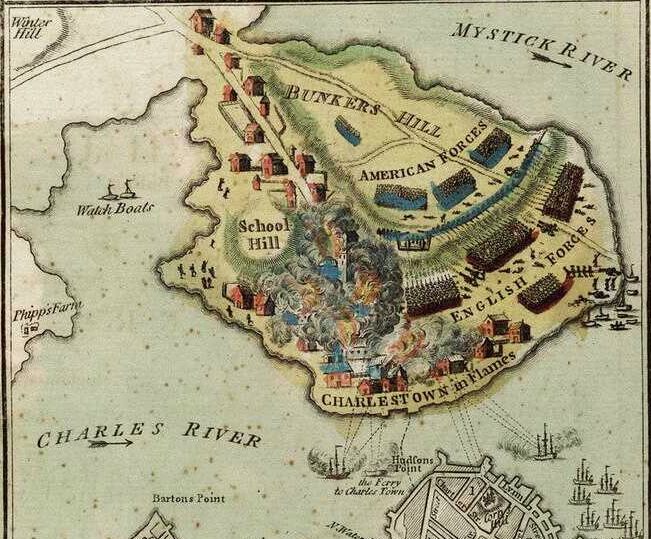 Likewise, Captain Nutting was recalled from Charlestown to cover the redoubt’s south flank. At 3 pm the British forces began their attack with a cannonade from their positions on Moulton’s, followed by an advance by the first two lines. [lxxxvii] General Pigot, with the 28th, 43rd, 47th, 52nd Regiments and Major Pitcairn’s marines, was ordered to take the redoubt on the left while Howe would take the main emplacements on the right. The light-infantry were dispatched to flank along the Mystic. [lxxxviii] The frontal attack was made by the Grenadiers and the 5th and 52nd regiments. 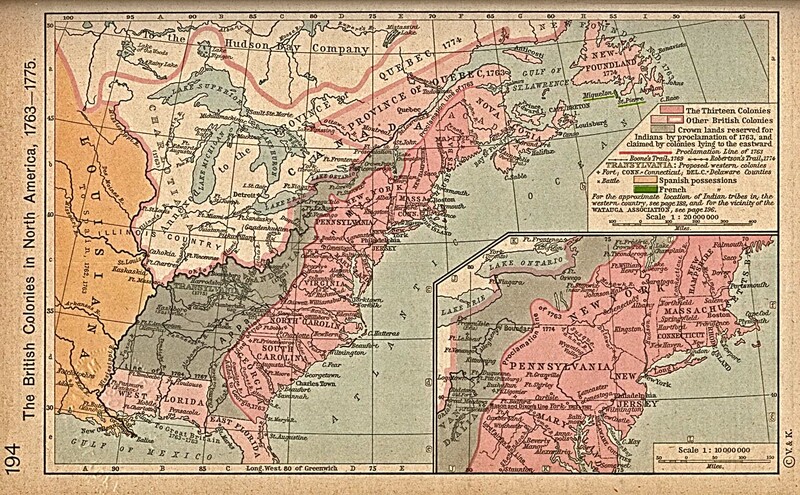 [lxxxix] The British reached the Continental lines at about 3:30. 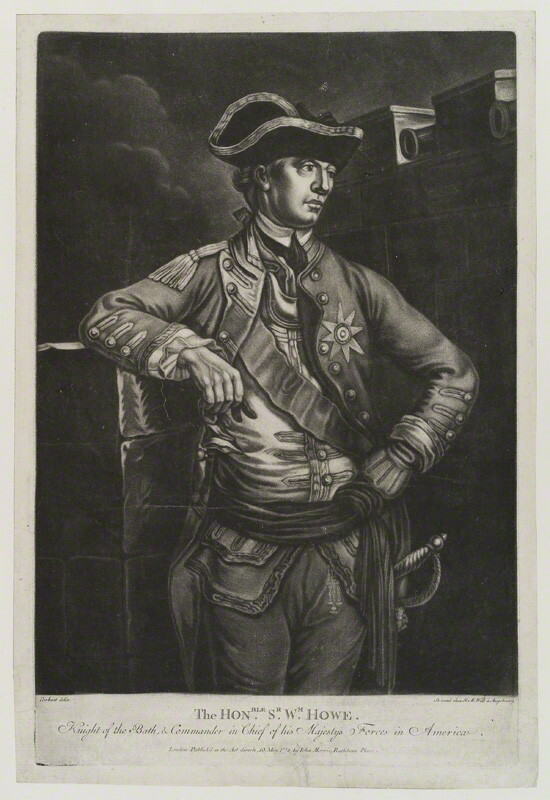 Admiral Graves, alleged to have gone ashore with Howe, at this point inquired if the destruction of Charlestown would be useful in reducing the harassing fire on the left wing. [xci] Howe agreed, and the order was given to fire red-hot shot into the town, while a group of marines from HMS Somerset landed with torches. 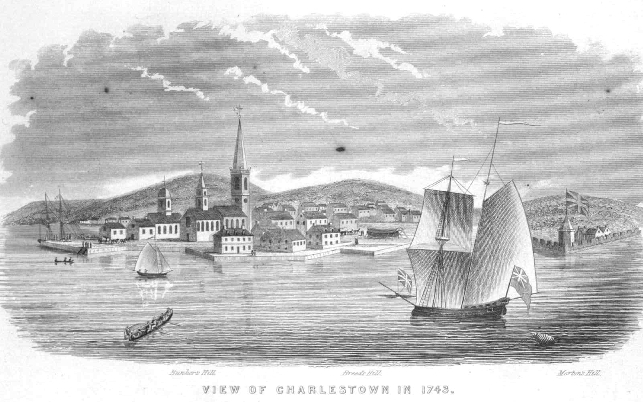 [xcii] The destruction of Charlestown produced a prodigious quantity of smoke, however, prevailing winds carried the smoke away from the battlefield. 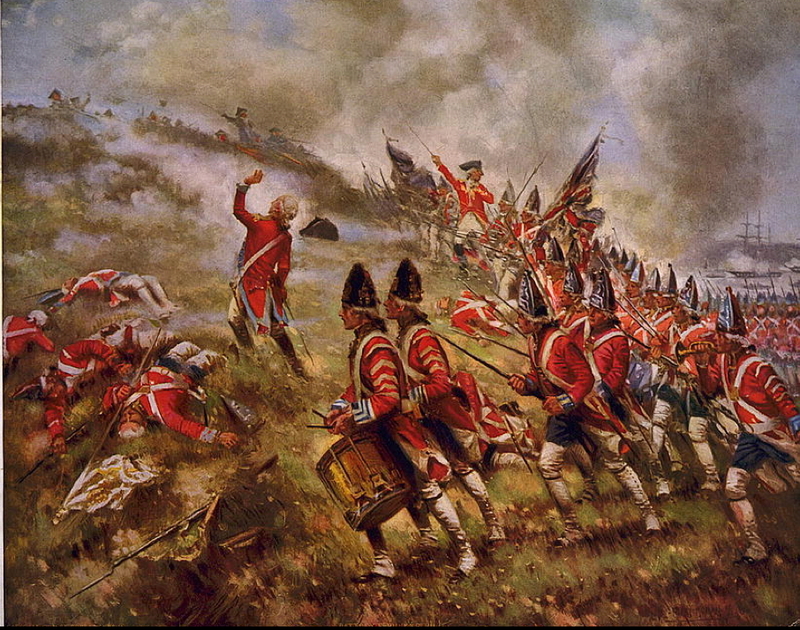 Howe rallied his force and led another assault, the British firing as they went in. [xciv] The line was again held, the Regulars mowed down by the accurate fire of the Americans, although not without loss: “Colonels Brewer, Nixon, and Buckminster were wounded, and Major Moore was mortally wounded.”[xcv] British casualties at this point were over 500 in number. [xcvi] Two of Howe’s aides had been shot. 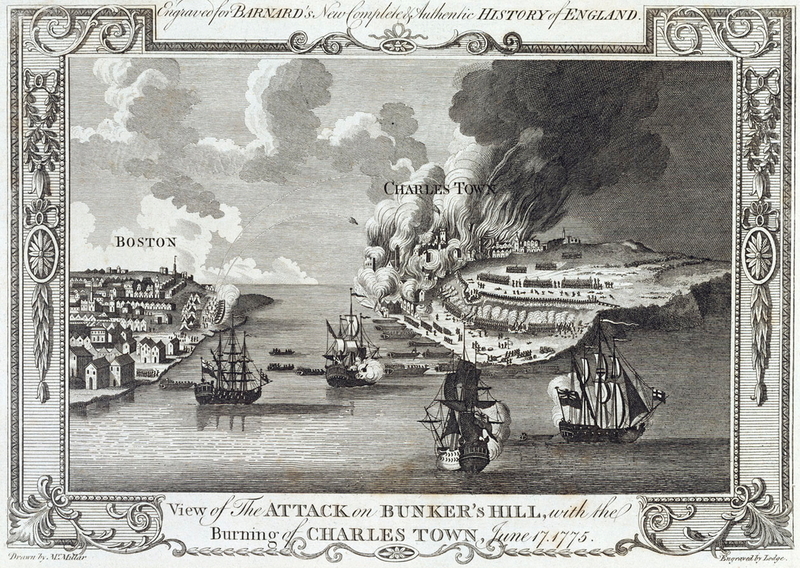 The supporting naval vessels intensified their fire, torching Charlestown. The fleet developed an intense cannonade of “bombs, chain-shot, ring-shot, and double-headed shot” and was able to clear some of Continental forces from the Breed’s Hill redoubt, likewise destroying some of the Continental positions along the fence-line. [xcviii] In preparation for a third charge, Pigot marshaled elements of the 5th, 38th, 43rd, and 52nd Regiments and returned to attack the redoubt. Clinton was by now in position to reinforce, and Howe ordered a general bayonet charge, this time concentrated against the redoubt. 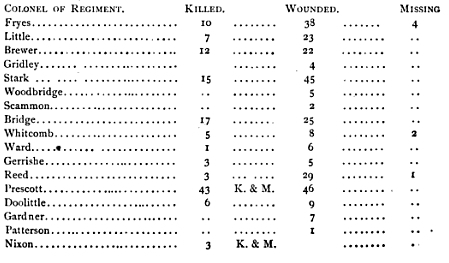 441 continental soldiers had been killed, wounded or captured. 5 artillery pieces were lost. 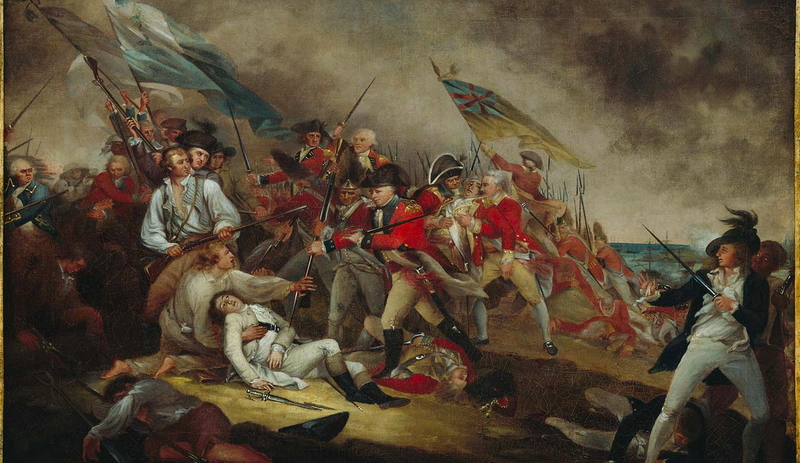 [cvii] Doctor Joseph Warren, General, Son of Liberty, Mason, had been killed. 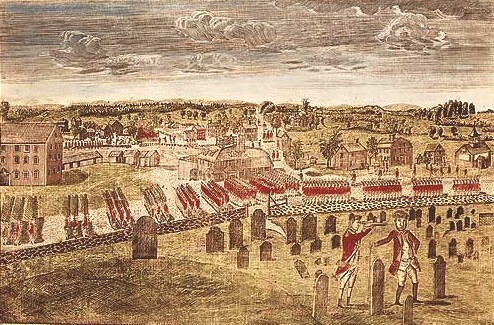 In the autumn of 1776, General Howe deployed from Halifax with 23,000 men and bested Washington at New York, forcing the latter to withdraw to avoid encirclement. [cxxi] Washington won minor victories and Trenton and Princeton at the end of 1776. 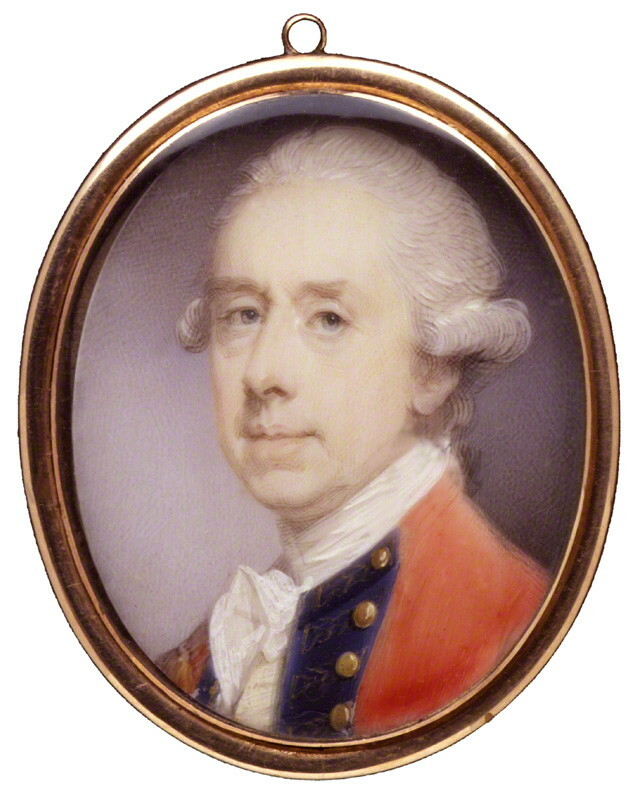 By July 1777, Howe confided in General Henry Clinton that he expected the war to last for another year, at least. [cxxii] The Royal Navy was to commence full mobilization in August 1777. 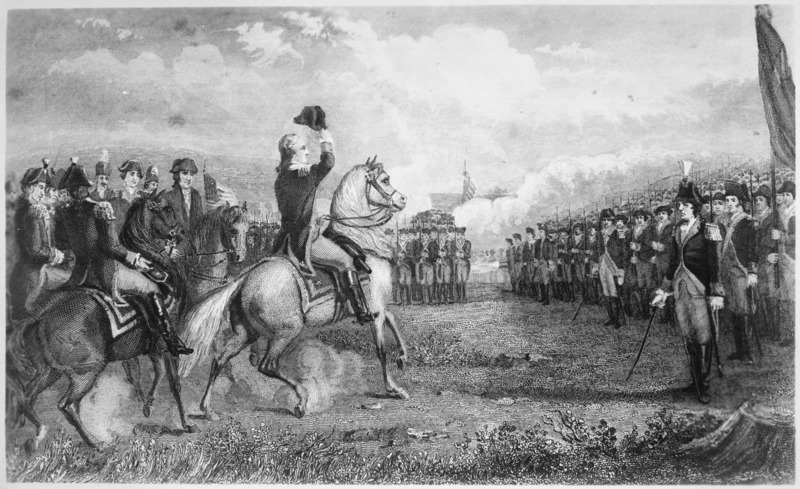 In November, General Howe issued a general pardon to all rebels who “surrendered and reaffirmed their allegiance to George III.”[cxxiii] The month before, however, the 1777 campaign came to its distressing close with Burgoyne’s surrender of over 5,000 regulars at Saratoga to General Horatio Gates. 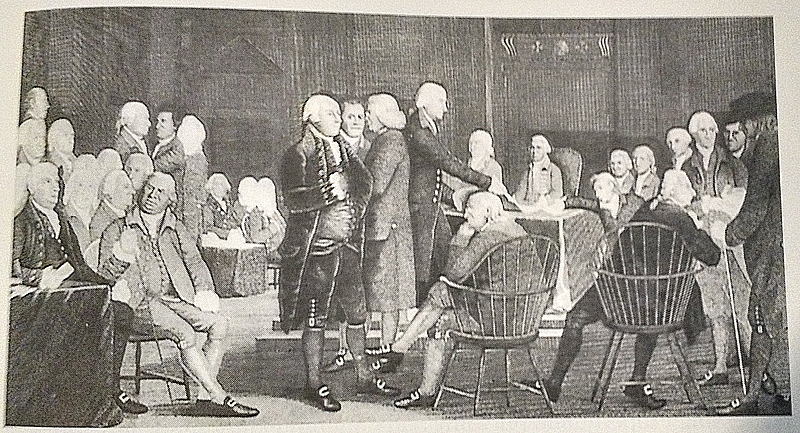 [cxxiv] In February 1778, Louis XVI entered alliance with the Colonies, followed by Spain in 1779. 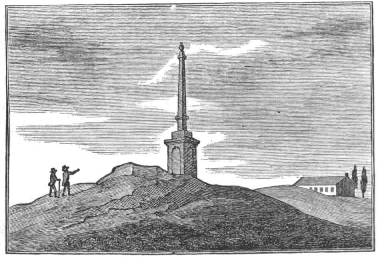 Enlarged Joseph Warren monument of 1842 visible. 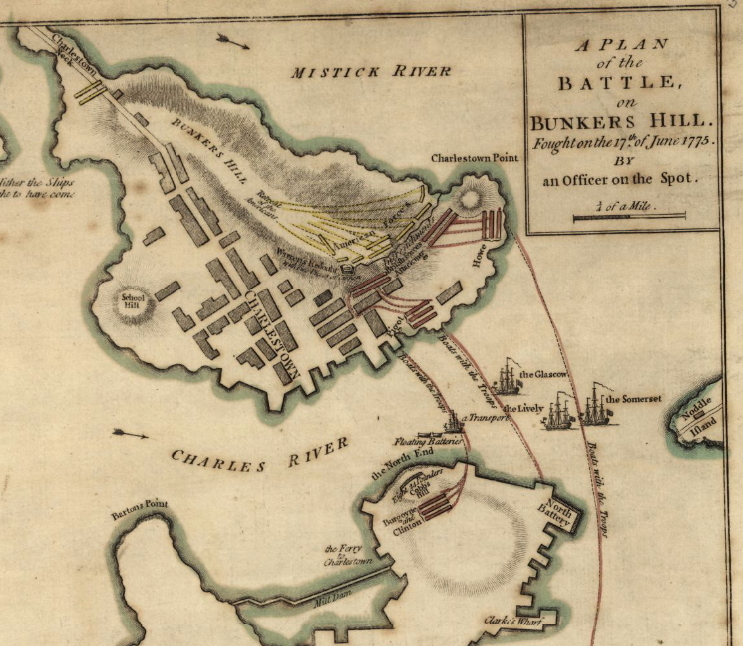 [xlvii] Richard Frothingham, “The Battle-Field of Bunker Hill: With A Relation of the Action by William Prescott, and Illustrative Documents” (Massachusetts Historical Society, 1876), http://lcweb2.loc.gov/service/gdc/scd0001/2001/20010131001bh/20010131001bh.pdf. [lxviii] A. W. H. Pearsall, “Graves, Samuel (1713-1787),” The Oxford Dictionary of National Biography (Oxford: Oxford University Press, 2004). [cvi] Carrington, Battles of the American Revolution: 1775-1781, Historical and Military Criticism. 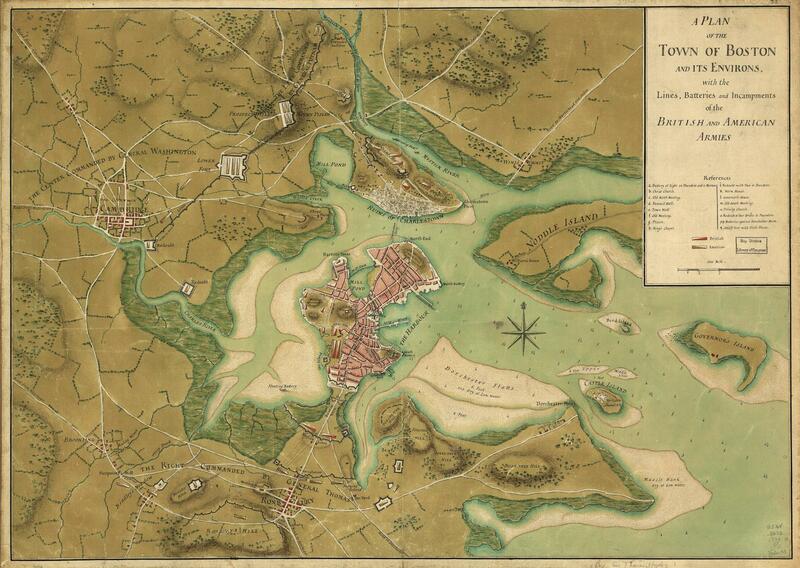 [cix] Battle of Bunker Hill, The Boston Patriot, June 17, 1818. [cxvi] H. H. Brackenridge, The Battle of Bunkers-Hill. A Dramatic Piece, of Five Acts, in Heroic Measure (Philadelphia: Robert Bell, 1776). 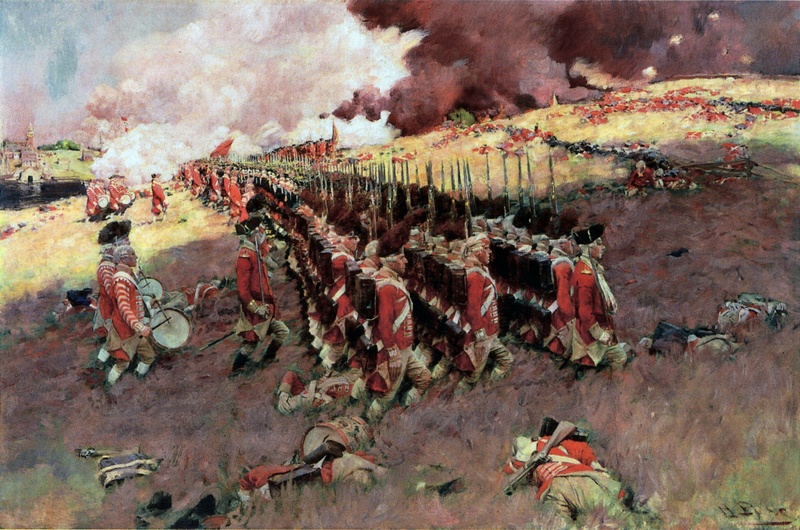 This entry was posted in Early Modern Warfare, Land Battle, Maritime Operations, Military Campaign and tagged 18th Century, American Revolution, Amphibious Operations, Battle of Bunker HIll, Boston, British Army, Continental Army, Infantry Tactics, Royal Navy. Bookmark the permalink.